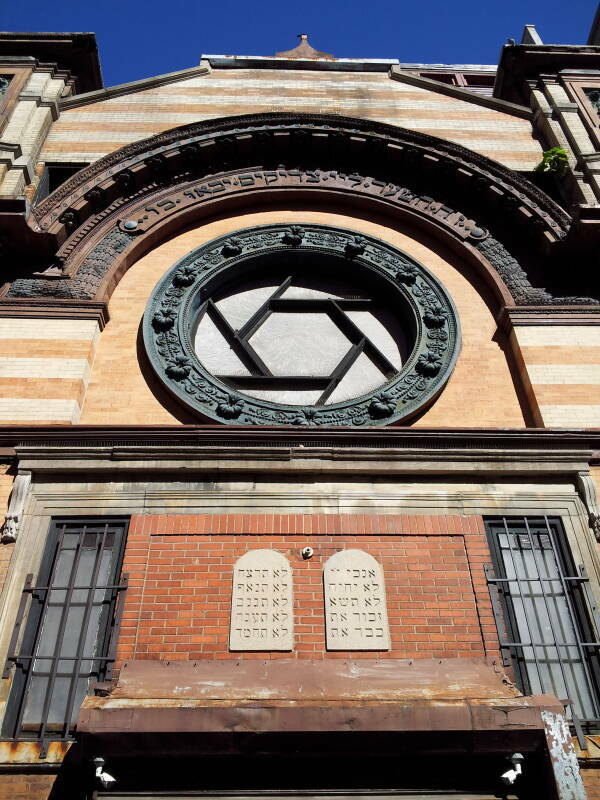 The Stanton Street Synagogue or the Stanton Street Shul, originally Congregation B'nai Jacob Anshe Brzezan (Sons of Jacob, People of Brzezan) was founded in 1894 by immigrants from the town of Brzeżany, in Galicia. Galicia was once an independent kingdom. Its territory is now southeastern Poland and western Ukraine plus a narrow band across northern Romania. The town is now Бережани in western Ukraine. 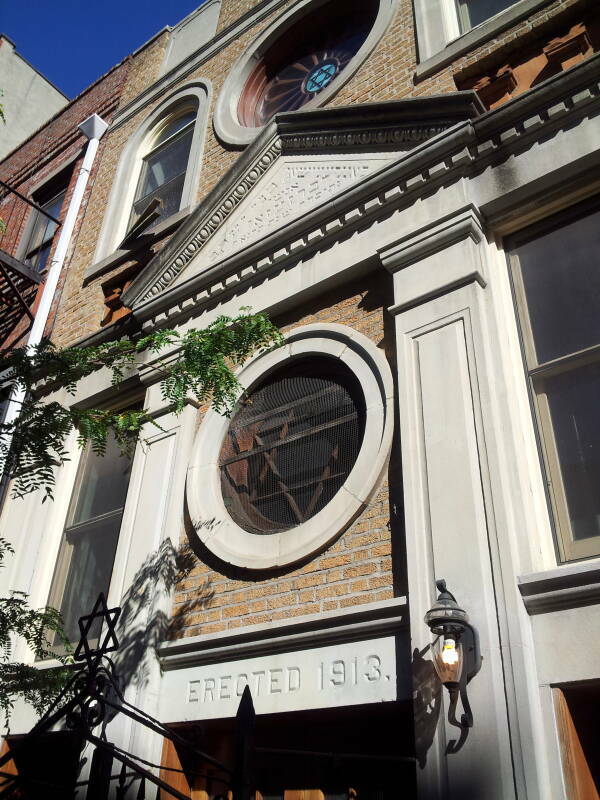 The congregation built their own synagogue at 180 Stanton Street in 1913. 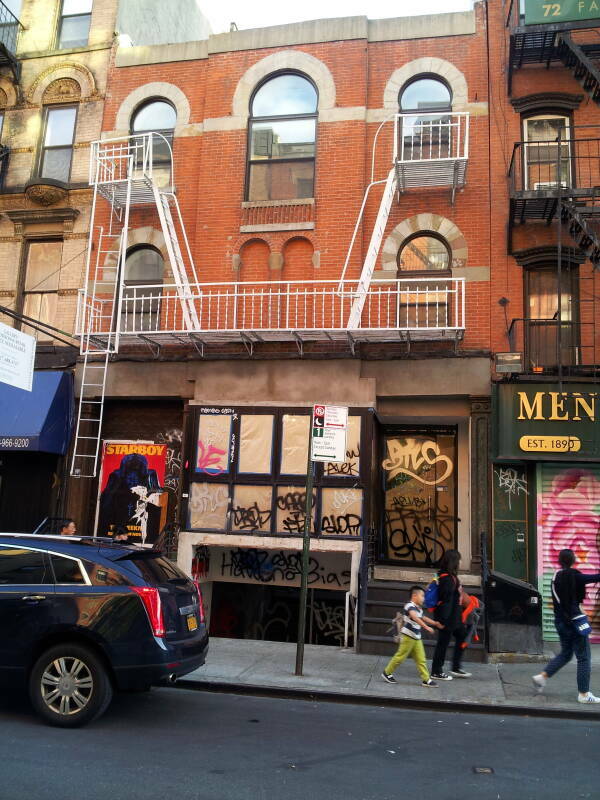 It is one of the last surviving tenement-style synagogues, a three-story structure built on a 20×100 foot lot and incorporating parts of two existing structures that had been built in the 1840s. The narrow lot and resulting shape of the main sanctuary, downstairs on the lower floor, means that the Torah Ark is on the north wall. 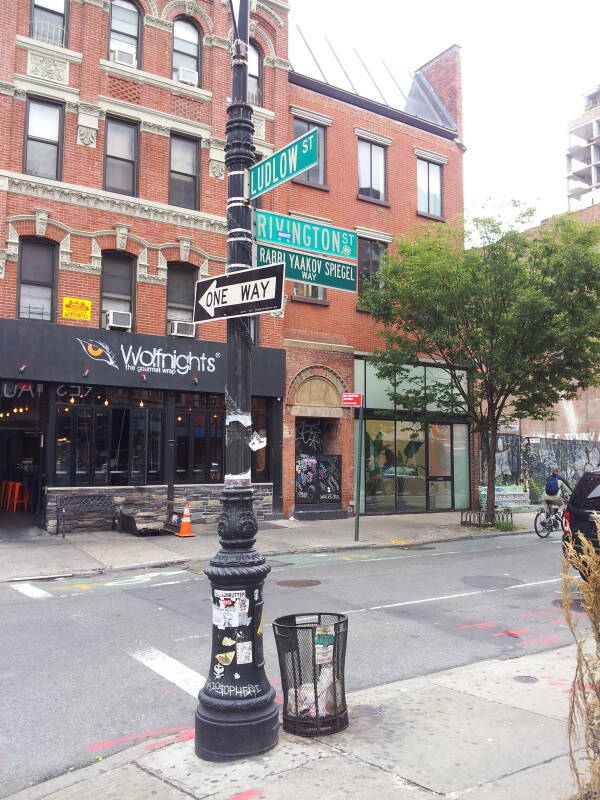 However, the grid of streets in the Lower East Side is offset from the true cardinal directions. The local nominal "north" (22°) is much closer to a great-circle path to Jerusalem (53°) than is nominal "east" (112°). The congregation shrank as Jews moved out of the neighborhood without being replaced by new immigrants. This started with the Immigration Act of 1924, accelerated in the 1930s and 1940s, and continued through the 20th century. The congregation of the 1980s and 1990 was mostly made up of the elderly and the working poor. By 2000 they had a hard time assembling a minyan, the quorum of ten men required for Orthodox prayers. The rabbi, who had served since 1964, arranged to sell the synagogue without telling the congregation. There was outrage, a case within a rabbinical court, and then it went to the New York State Supreme Court. The controversy brought attention to the ailing congregation and attracted a surge of younger members. By 2004 the membership had grown to over 100, and by 2012 the majority of members were younger than 35. This synagogue at 58-60 Rivington Street was built in 1903 by Jews from the Moldavian city of Iaşi, part of Romania since 1859. The city's name was sometimes spelled "Jassy" and "Iassy". It lies in the lowlands along the Prut river just east of Bucovina, close to the border with what is now the independent country of Moldova. By the mid-1800s the immigration of Jews from Russia and Galicia into Moldavia had boosted the population of Iaşi to 60,000 to 70,000, of which at least one-third were Jewish. Iaşi was the home of the first Yiddish language newspaper in 1855, and what was possibly the first Yiddish theater performance in 1876. The congregation sold the building in 1912 to the Erste Warshawer (or First Warsaw) Congregation, which had organized in 1886. Since 1973 the interior has been converted into residences and artists' studios. The First Roumanian-American Congregation, Congregation Shaarey Shamoyim, שַׁעֲרֵי שָׁמַיִם or "Gates of Heaven", organized in 1885. This may have been the result of re-organizing a congregation that had been founded in 1860. 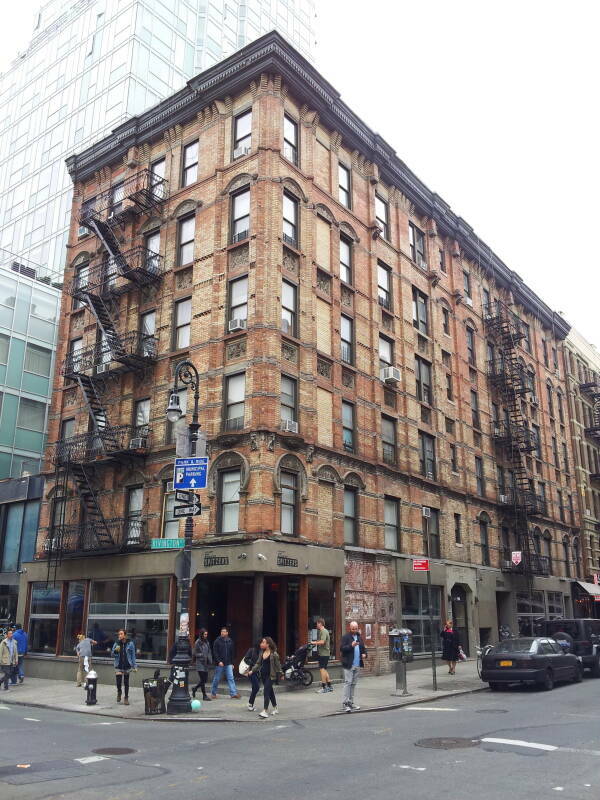 It had initially met at 70 Hester Street, close to the Romanian quarter. 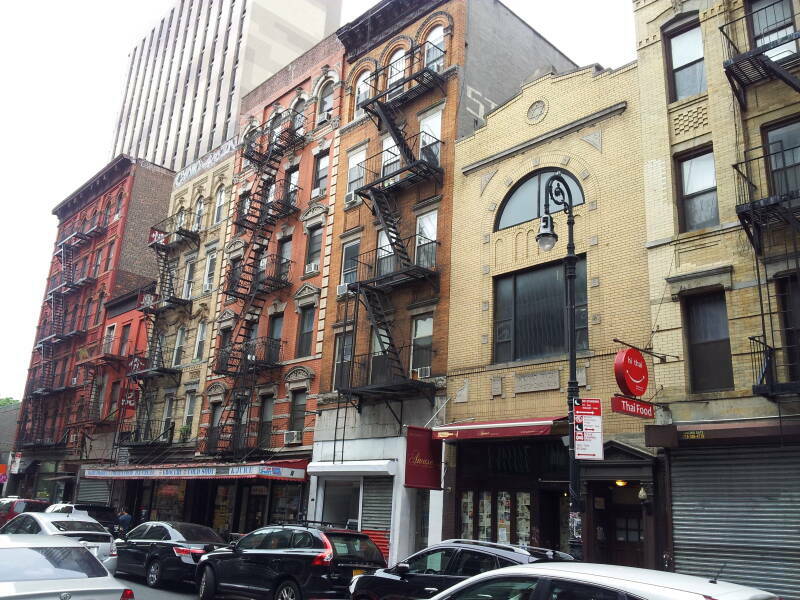 70 Hester Street, the three-story building at center. 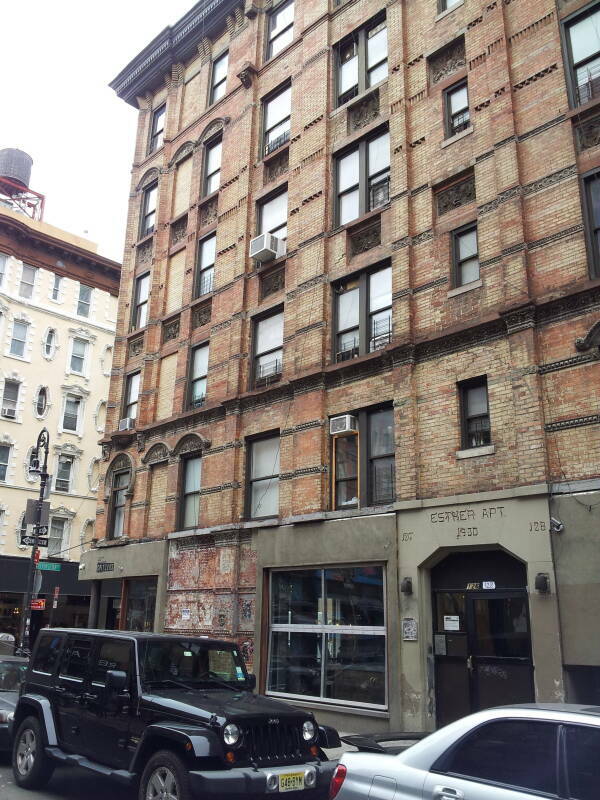 70 Hester Street, the first home of the 1st Roumanian-American Congregation. 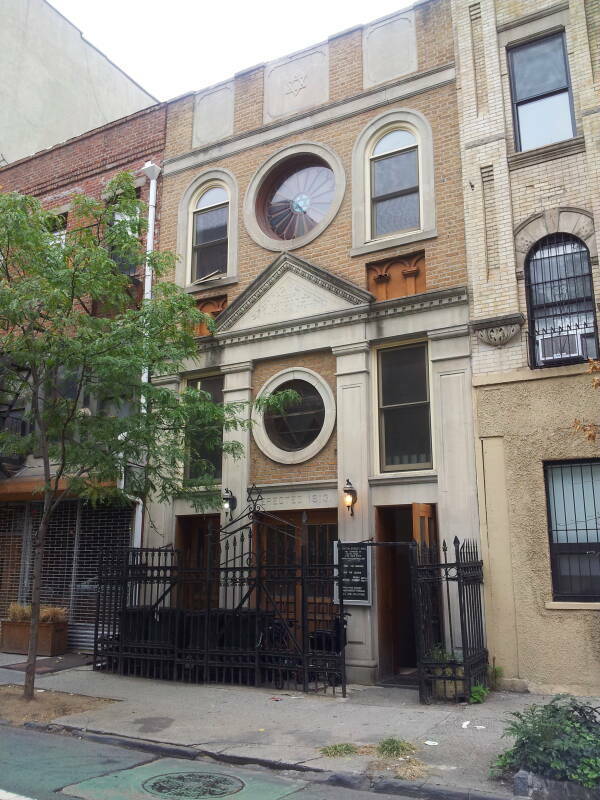 The Second Reformed Presbyterian Church built a church at 89-93 Rivington Street around 1860. This was when the area was predominantly German and Protestant. In November 1864 the German Presbyterians sold the building to a German Orthodox Jewish congregation. 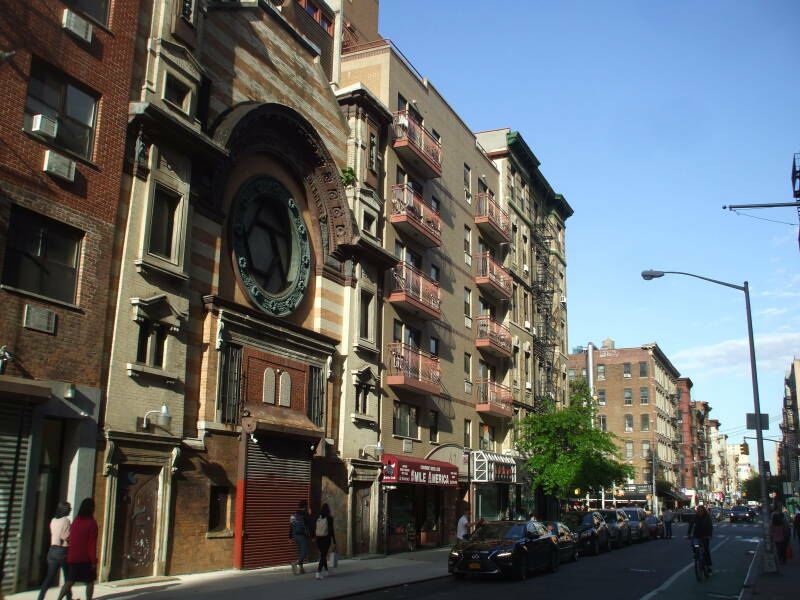 The German-Jewish community had mostly moved out of the Lower East Side by the late 1880s, and that German-Jewish congregation moved to 216 East 15th Street, near Second Avenue. They sold the building to the New York City Church Extension and Missionary Society, part of the Methodist Episcopal Church. The plan was to "attract Jewish immigrants seeking conversion", but it was unsuccessful. In 1902 the Methodist Episcopal Church sold the building to Congregation Shaarey Shamoyim, the First Roumanian-American congregation. They carried out extensive renovations — removing Christian symbols, adding a Torah ark and bimah, the central platform from which the Torah is read, and adding skylights. The resulting structure was about 20 meters wide by 30 meters deep, seating 1,600 to 1,800. The size, plus the high ceiling and good acoustics, led to its being called "the Cantor's Carnegie Hall". Emanuel Goldenberg (Edward G Robinson), Nathan Birnbaum (George Burns), and Aaron Chwatt (Red Buttons) were among its active members. Goldenberg/Robinson was born in Bucharest. The Union of Orthodox Jewish Congregations of America held its third annual convention here in 1903. It passed some significant resolutions urging Orthodox assimilation into American culture — the civil court system should have priority over the rabbinical one, and congregations mostly foreign-born should "secure an English-speaking rabbi for the benefit of their American-born English-speaking children." In following years, the congregation brought attention to continuing pogroms in Russia, and raised money and campaigned for the Jews remaining in Romania. 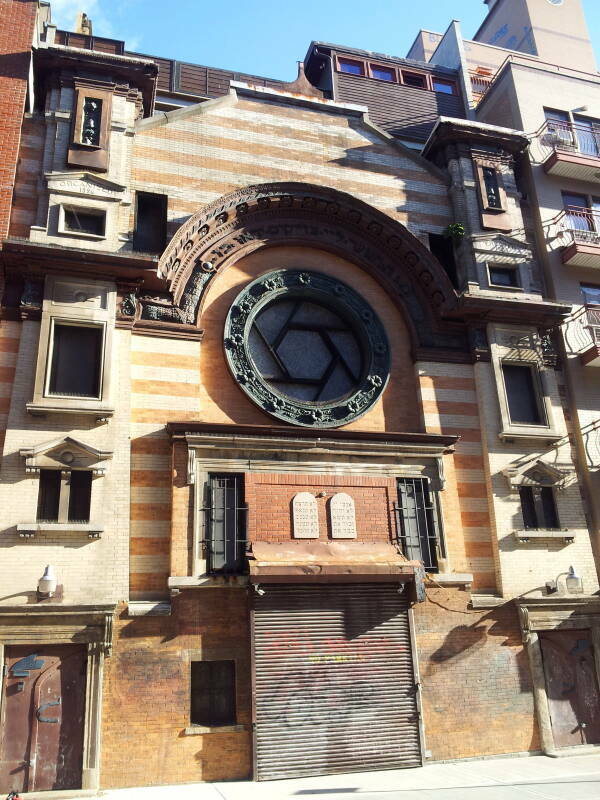 In 1905 the synagogue hosted the city's only memorial service for John Hay, former U.S. Secretary of State, who had worked on behalf of the oppressed Jewish population in Romania. Structural improvements were made into the 1960s. 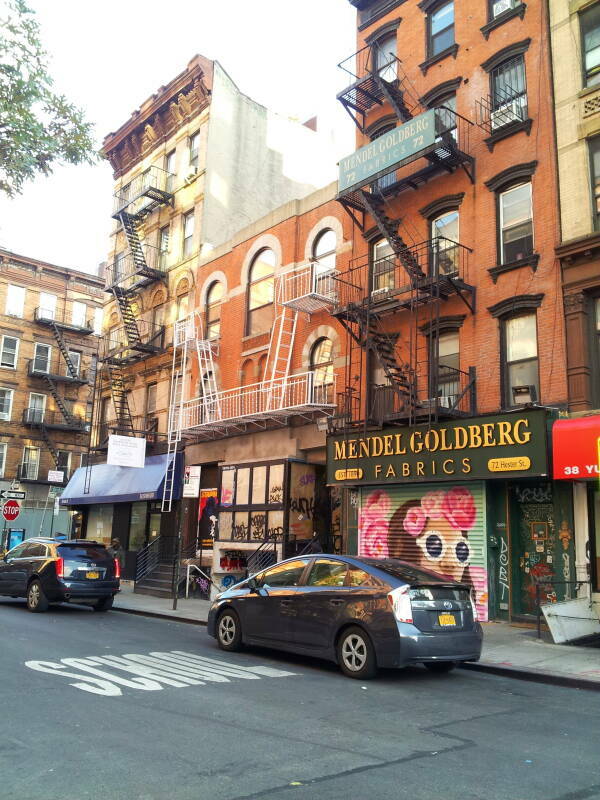 However, the congregation dwindled as the Jewish population moved out of the Lower East Side. It was an Orthodox congregation, so members had to be able to walk to the Sabbath service. In the 1990s they could still assemble a minyan of ten men for weekday prayers, as some neighborhood businessmen could attend early morning and evening prayers before and after the business day. Total membership was just a few dozen by 1996 when services moved to the basement. The main sanctuary was deteriorating, it was too expensive to maintain. The roof caved in on January 22, 2006, and the building was demolished in March 2006. 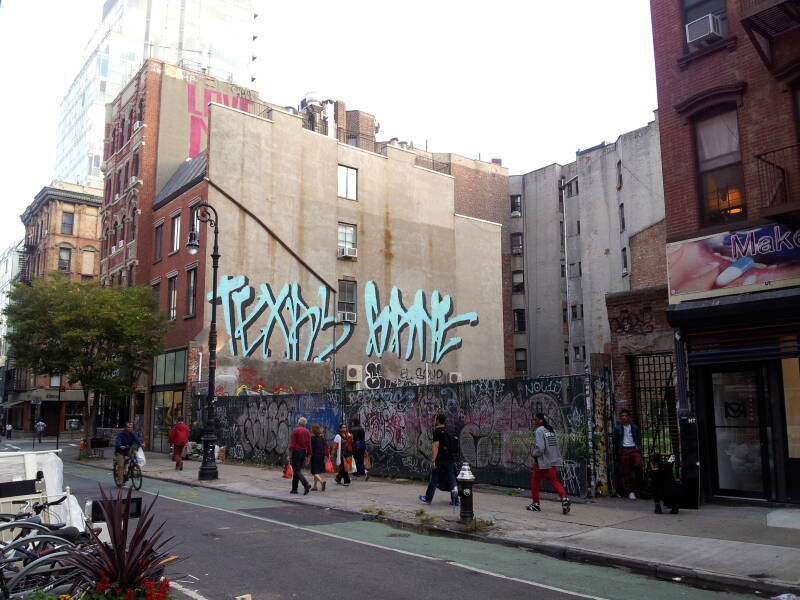 Ten years later it was still a fenced-in vacant lot as seen below. 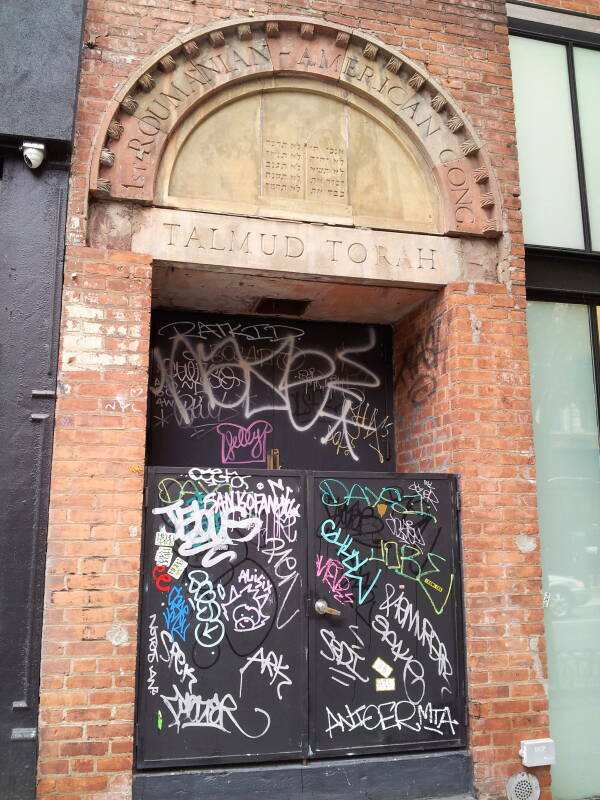 The archway over the entrance was relocated to the small building on its east side, which had been its Talmud Torah or school. 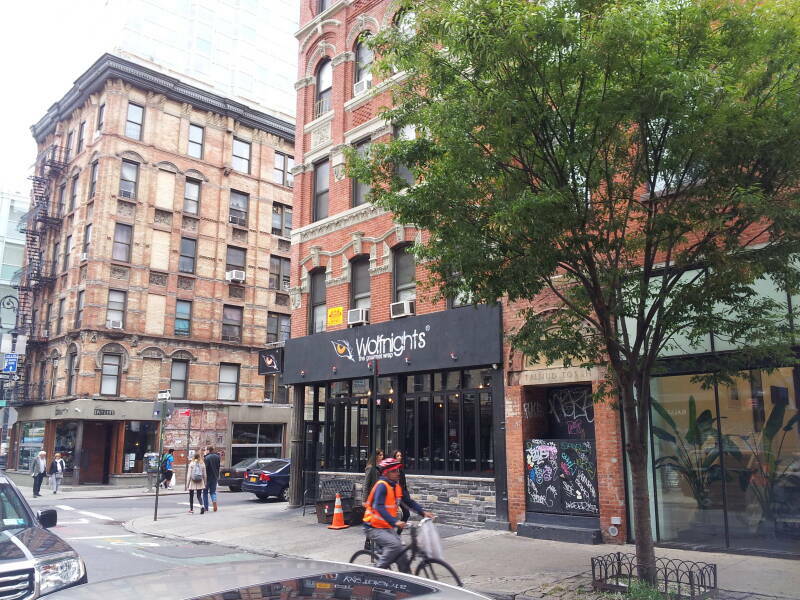 Spitzer's Corner, a bar on the ground floor of the tenement building at the southeast corner of Rivington and Ludlow, used to be a clothing store. 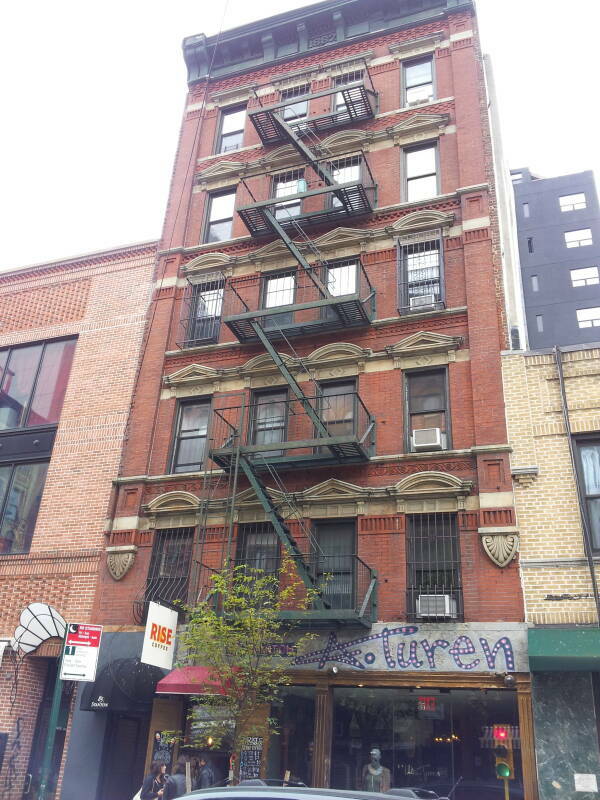 The Esther Apartments building at 126-128 Ludlow Street has faux-Hebrew lettering around its entrance. 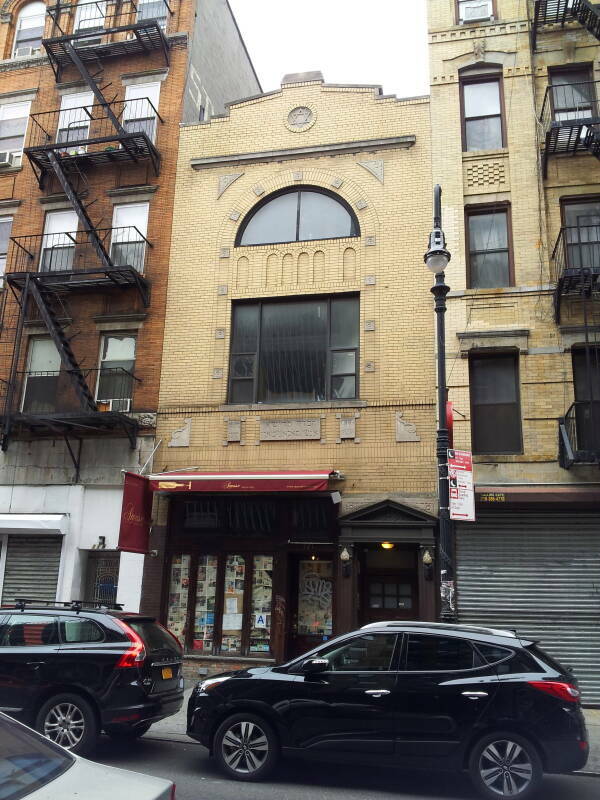 Congregation Chevra Kadisha Anshe Sochaczew, 121 Ludlow Street. Congregation Chevra Kadisha Anshe Sochaczew, or Sochotshov Countrymen Synagogue, was organized in the 1880s by recent immigrants from the town of Sochaczew. That town is now in Poland, but back then it was in the Russian Empire and subject to periodic pogroms. As new immigrants, they were poor, and met in homes and stores on the Lower East Side. 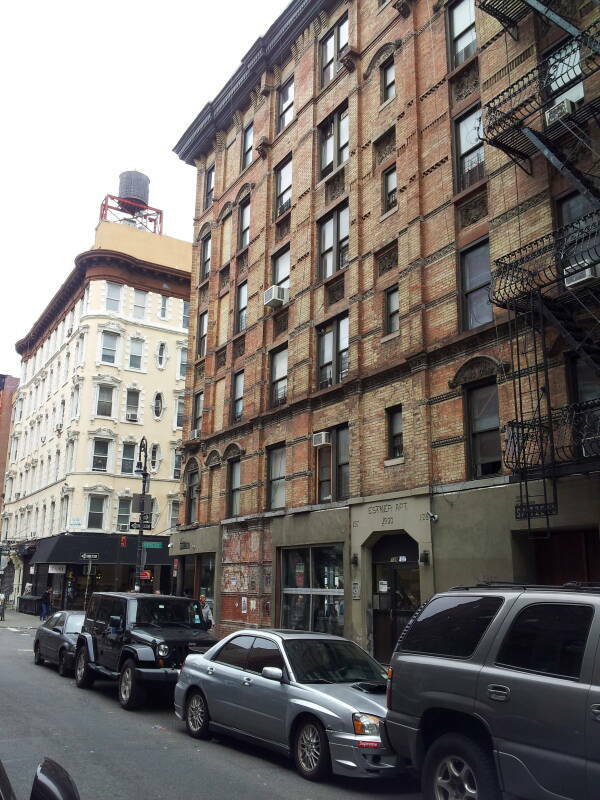 In 1904 they more formally organized and rented space in a tenement at 121 Ludlow Street. In 1920 they built a three-story brick building on the site, with large windows and the second and third floors. They maintained a cevra kadisha, a burial society that ritually bathes and dresses the recently deceased in accordance with Jewish law. 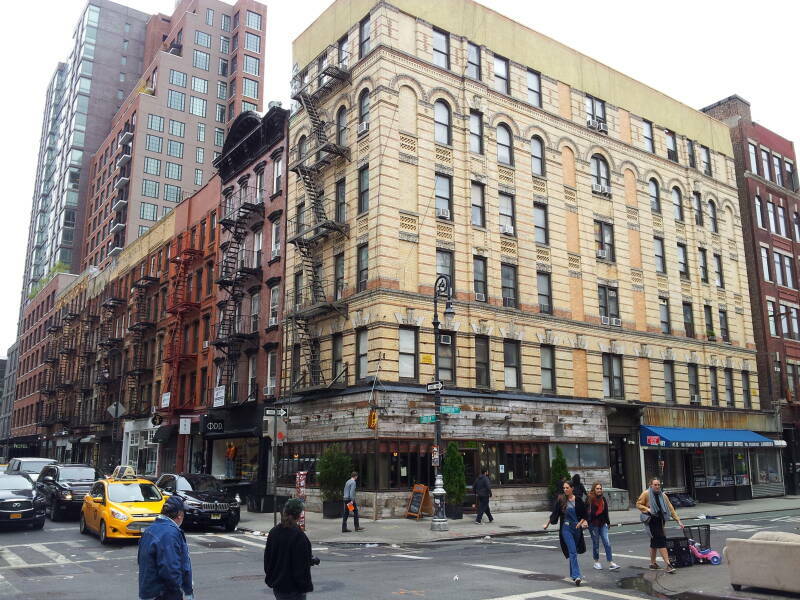 The members became successful as the neighborhood declined, and so the congregation sold the building and left the Lower East Side. Since then the building has housed a series of restaurants on the ground floor and apartments above. 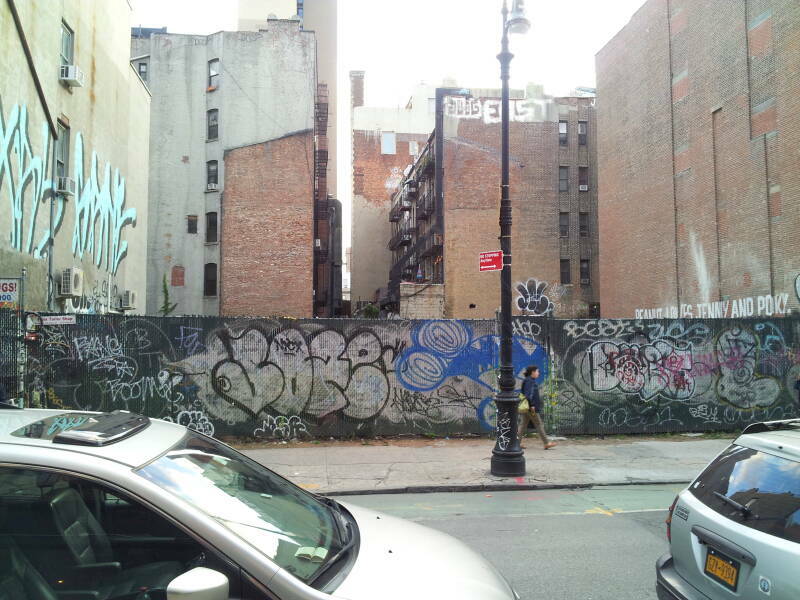 Looking west across Allen Street toward Kehila Kedosha Janina at 280 Broome Street. 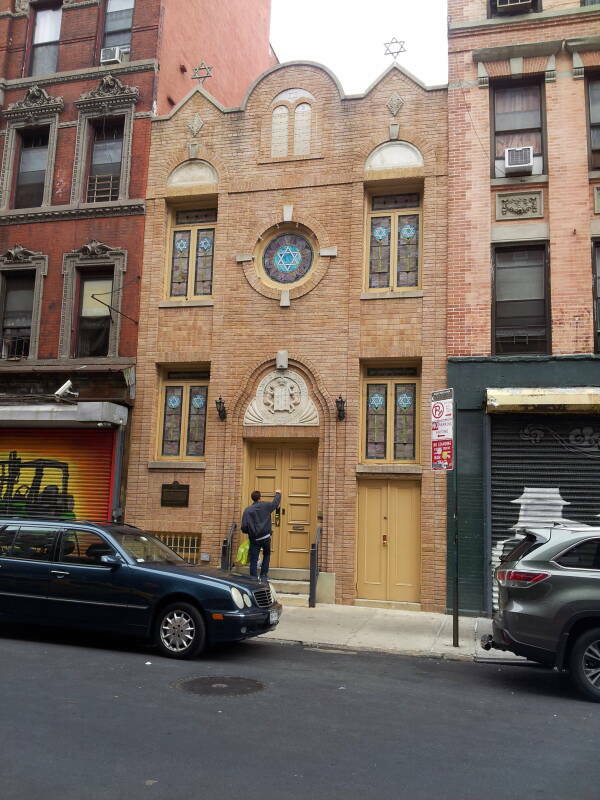 This is the only Romaniote or Greek Jewish synagogue left in the Americas. It was built in 1927 by a group of Jewish immigrants from the Greek village of Ioannina (or Janina). Ιωάννινα or Ioannina is in Ήπειρος or Epirus, the westernmost administrative region of Greece, on the Ionian coast and the Albanian border. 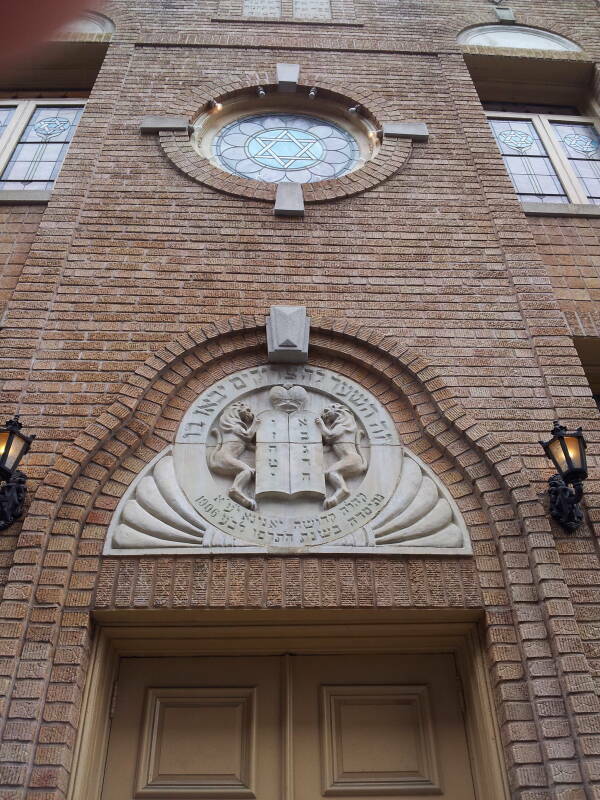 This synagogue had three rabbis and standing room only at the High Holidays from then through World War II. 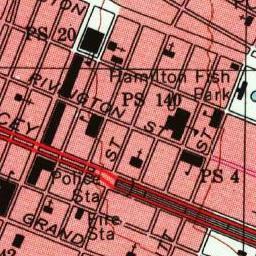 After 1945, members began moving to other parts of Manhattan and to other boroughs. It often has difficulty assembling ten men for the minyan for the weekly Sabbath services, but they still hold weekly Sabbath services as well as services on holidays. 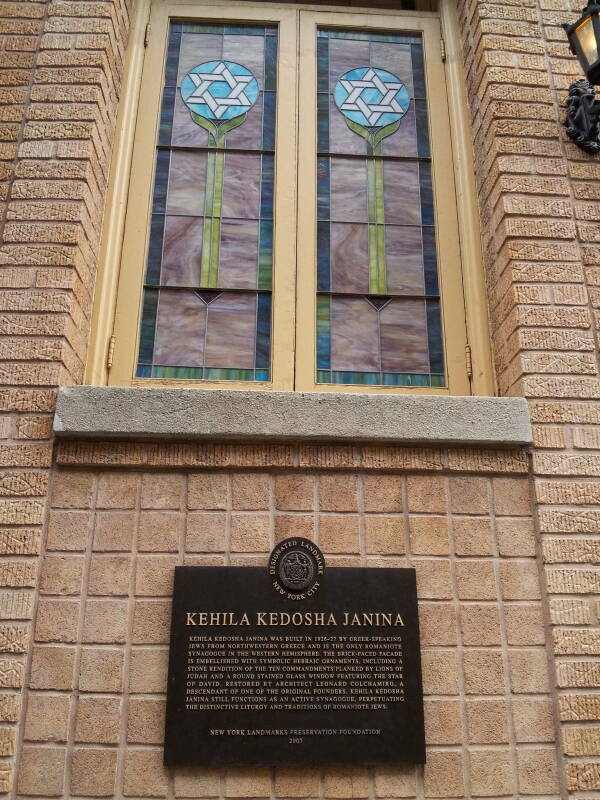 Kehila Kedosha Janina Romaniote synagogue at 280 Broome Street. In the west we mostly know of the Ashkenazim and Sephardim, but the Romaniote or Ρωμανιώτες make up a third branch of Judaic heritage. Romaniote oral tradition says that the first Jews arrived in Greece soon after the Romans destroyed the Second Temple in Jerusalem in 70 AD, but Jewish people were living in Greece long before then. Oropos, a little northeast of Athens, is the site of an inscription dating back to 300-250 BCE and mentioning "Moschos, son of Moschion the Jew". There were once Hellenized Jews living throughout greater Greece, including the areas of southern Italy known as Magna Graecia, and later throughout the Ottoman Empire, from Crete in the south through the Crimean peninsula in the north. The Romanyotim stayed in place as the Byzantine Empire was replaced by the Ottoman Empire, and the Ottomans expanced. They have always been distinct from those Shephardim Jews who were expelled from Spain in 1492 and then settled in Ottoman-controlled Greece. For one thing, the Shephardim spoke Ladino, a Romance language also called "Judeo-Spanish", while the Romanyotim spoke dialects of Greek. Now just about 1,500 Romaniote Jews remain in Greece, mainly in Ioannina and in Chalcis, north of Athens. Some 45,000 that survived World War II went to Israel. This synagogue has about 5,000 people on their mailing list but only a handful come to weekly services. 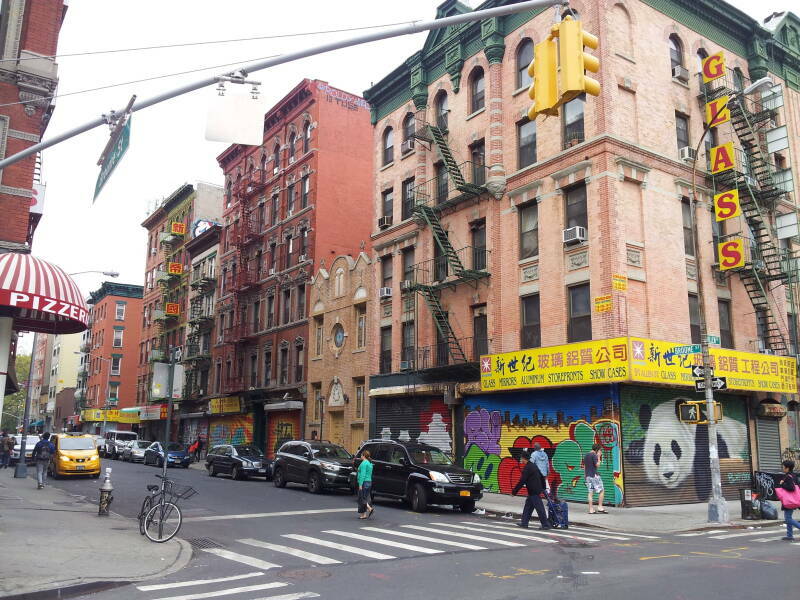 Grand Street is a major thoroughfare running east-west across lower Manhattan, from near the East River, through the Lower East Side, and on through Little Italy and Chinatown.